In an older post I've mentioned how sentimental I am about letting go of my big bike. Well I've gotten over being emotionally attached to the old machine. It's no longer practical. I don't ride so often anymore now that I work at home, and that's just not healthy for the bike. The decision to sell the bike came when it wouldn't start again (June 12). I had it picked up for the last time and asked my mechanic friend James to sell the bike in his shop. The bike got sold today, after 32 days, to a Korean guy. I hope he would use it more often than I did in 6 years. I only got to maximize its use on the first 2 years since I got it in 2005. I use to ride to work everyday back then, and often join rides out of town on weekends. I started riding less in 2007 when I worked in the family business in Cavite. It's just inconvenient to ride like 20 kilometers to get to work everyday. Before we parted I touched the bike and felt it for the last time. 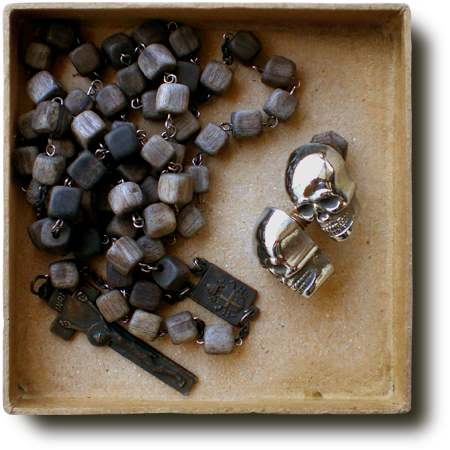 I took the wooden rosary that I've twined around the handle bar. Also the skull bolts, that secures the registration plate, given to me by a rider friend. They will be passed on to my next big bike. I'm not hasty about getting a new one though. But I'm not left bike-less. 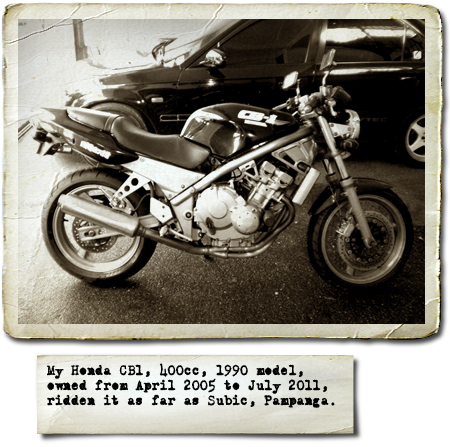 I actually have another motorcycle which came before the Honda CB1. 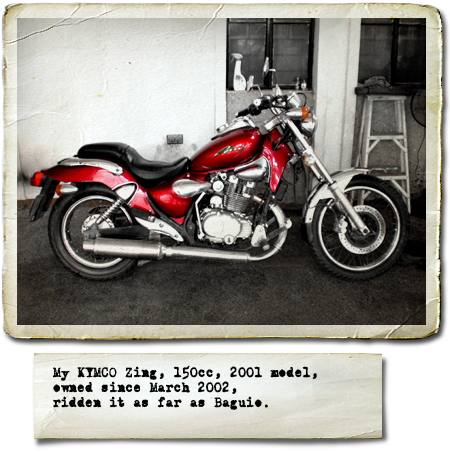 This red cruiser, the KYMCO Zing150, has been the spare bike whenever the CB1 fails. It is my first bike. I got it in 2002. It's old and has issues too. Once I have it repaired I'll sell it away and then think of what motorcycle to get next.